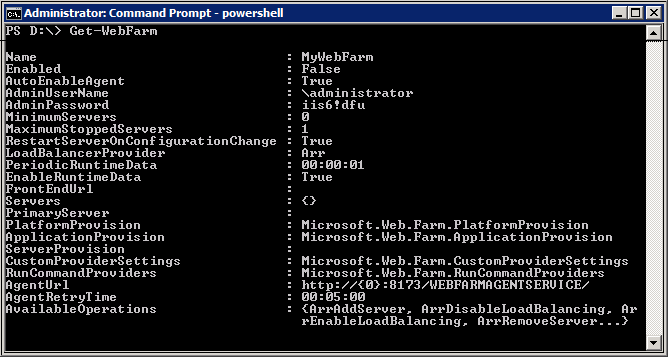 You can use the Web Farm Framework cmdlets for Windows PowerShell to configure and manage your server farm. 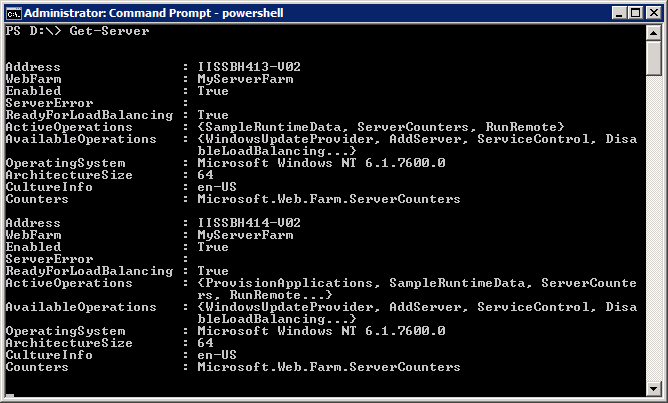 You must have Windows PowerShell installed on the web farm controller. On the controller server, open a command prompt. The Web Farm Framework snapin for Windows PowerShell is loaded. To get help for each cmdlet, enter get-Help <cmdletName> -full. For example, to get help for the Get-ActiveOperation cmdlet, enter the following command. You can perform management tasks for the server farm or a specific server in the farm using the cmdlets. The following table lists the cmdlets for these tasks. Get-ActiveOperation Returns the operations currently running on the server or server farm. Get-AvailableOperation Returns the operations available on the server or server farm. Get-Server Returns a list of servers in the farm, or, if you specify a signal server, it returns the specified server. Get-ServerProcess Returns a list of the processes currently running on the server or server farm. Get-ServerRequest Returns a list of the requests currently being processed on the server or server farm. Get-TraceMessage Returns a list of the trace messages from the server or server farm. Get-WeNbFarm Returns the name of the server farm or farms available. Install-ServerProduct Installs the specified product on the server or server farm. 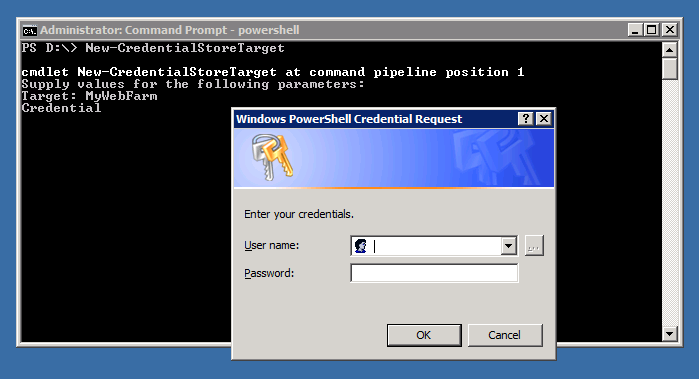 New-CredentialStoreTarget Adds a new target to the Windows credential store. New-MiniDump Returns dump information from the server. New-Server Adds a server to an existing server farm. New-WebFarm Creates a new server farm. Remove-CredentialStoreTarget Removes a target from the Windows credential store. Remove-Server Removes a server from the server farm. Remove-WebFarm Removes a server farm. Run-Operation Executes the specified operation on the server or server farm. Start-Server Starts the specified server. Stop-Server Stops the specified server. Provide the name of the new web farm and your credentials as prompted. Provide the name of the web farm and server address as prompted. The servers in the farm are displayed. 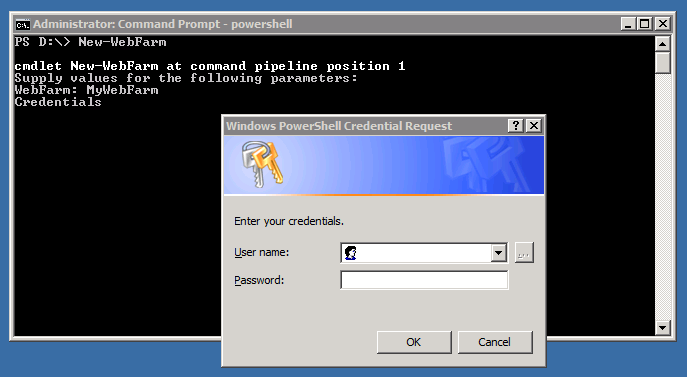 Using Window's credential store, users can store passwords and access credential stored password information via the command-line. This is very useful if you want keep your password from showing up in any log files that may capture command line input. The credential store saves a target along with your user name and password. The target is a string that is used to identify the credential information. Provide the target and your credentials as prompted. Provide the target to be removed as prompted.